Oskar Eustis takes on the would-be iron-fisted ruler with a heavy, heavy hand. Gabe Cohn reviews. You likely already know about the Oskar Eustis-directed production of Julius Caesar, which opened The Public Theater’s annual Shakespeare in the Park program, from the controversy it’s been stirring. This upset revolves mostly around the portrayal of Caesar as President Donald Trump, and by extension, its inclusion of an assassination scene that might have you looking over your shoulder for a secret service shutdown (or, more likely, Breitbart trolls). As of this writing, both Delta Airlines and Bank of America have pulled their financial support for the theater in response to the production, which has in turn sparked heavy backlash from artists and consumers, who cite the two sponsors’ withdrawal as a rejection of free speech in the arts. 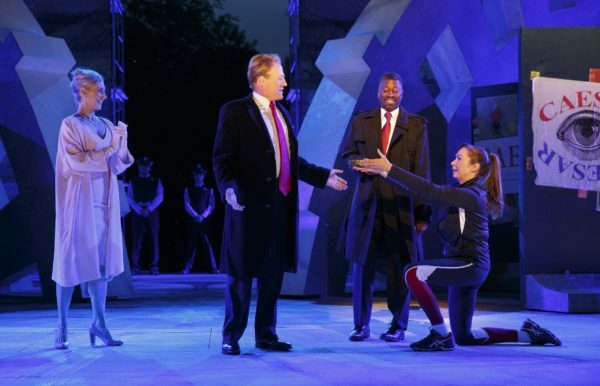 It seems unlikely that anyone seeing an American production of Julius Caesar in 2017 would make it through the play without forming a connection to the country’s political situation, regardless of their own stance, and with or without the Trump & Co. costumes. But, controversy aside, what do we learn from the play being explored in this way? More often than not, the hyper-contemporary Trumpian veneer that’s been slathered over this production like a gold paint carwash does end up amplifying fleeting moments of close connection to our present day, but it does so at the expense of the play’s larger message. The issue is that, while the production’s Trump lens might aid in bringing out more of these moments of present-day connection, the underlying study of the breakdown of democratic power and its aftermath ends up taking a backseat to one-liners. The deeper message of the play – that the group rebelling against Caesar ends up destroying their republic by resisting him via violent, undemocratic means – is difficult to see when we’re laughing at the lines above, or at our small-handed Caesar doing Trump mannerisms and letting his balls hang out Lyndon B. Johnson-style in front of his staffers. In such moments, we’re not connecting with the Shakespeare; we’re laughing at the Donald. The full effect of this can be felt in the second half, post-assassination, when we quickly find ourselves in a generic dystopia-lite, where the confusion over who to root for has less to do with the complex morals of the source text (was the assassination justified?) and more with the fact that, up until the assassination, we’ve been too busy using our view of the Trump administration as stand-ins for the actual characters to truly form a view of the story that can withstand the shift from the familiar, pre-assassination world that supports it to the unfamiliar post-assassination one that does not. We haven’t been listening to the details of Shakespeare’s narrative; we’ve been imposing our own, and it’s the one we went in wanting to see. And sometimes, what the production thinks we want to see is troubling. When Calpurnia first speaks, she’s been onstage for a while. We’ve had ample time to take her in; she is, without a shadow of a doubt, a Melania Trump avatar. It shouldn’t be much of a surprise, then, that when she delivers her first line, she reveals a Slavic accent. But it is surprising. The timing of the moment onstage is clearly engineered for laughs, and, on the night I went, it got them. Except, the only joke there is that Melania Trump has an accent. At best, it’s a cheap shot. It’s not all bad news. Beneath the cheap orange glow of the production’s heavy-handed Trump paint job is a superb cast (John Douglas Thompson’s Cassius, Eisa Davis’s Brutus, and Nikki M. James’s Portia are all excellent), packaged with smart design from David Rockwell (scenic) and Jessica Paz (sound). But it’s the Public, and it’s Shakespeare in the Park – this sheer technical quality is a minimum expectation, which makes the production’s larger concept even more crucial. It’s also worth noting an unfortunate missed opportunity presented by the American specificity of the production: it downplays the fact that the current nationalist threat – and indeed, the rise of figures like Trump who have been using rhetoric to take advantage of it – is a global one. While the play itself has parallels that could be applied to America, France, Britain, etc. (the list goes on), this production’s American specificity hampers the audience’s ability to view the play (and, by extension, the political situation that the production means to reflect) with a global eye. In an odd way, it’s as America-centric as those whom it aims to satirize. While there’s no doubt that the lessons Julius Caesar can still teach us are present here, and that the play is fiercely relevant to our contemporary world, the nuance of the production’s source material is too often sacrificed in the name of lightweight satire, cheapening the first half and muddying the message of the second. When the Public released a statement explaining that, no, their production isn’t purely one-sided – that it’s also a warning against non-democratic means of fighting political figures you do not agree with – they were absolutely speaking the truth. But it doesn’t help that everything in the production that precedes the Caesar/Trump assassination sets you up to view it as mockery. But boy oh boy, the Public has a right to produce it.